You are all starting to look like you can't wait for Friday to get here, so I decided to gather up a dose of some rad poster art for you. 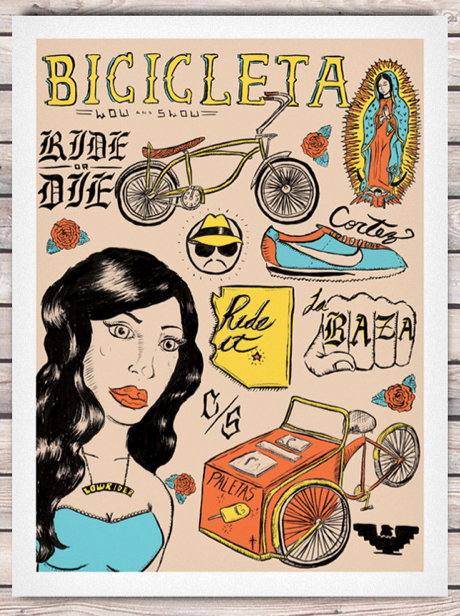 People of the wheeled lifestyle seem to like art they can relate to. I'm ready to go get me a coconut PALETA from that bike (ice popsicles). I also liked the quote from one of them "take the scenic road." Design, colour and posters are part of my daily visual motivation and hope you like these, they are quite gorgeous. I have picked a couple to share. 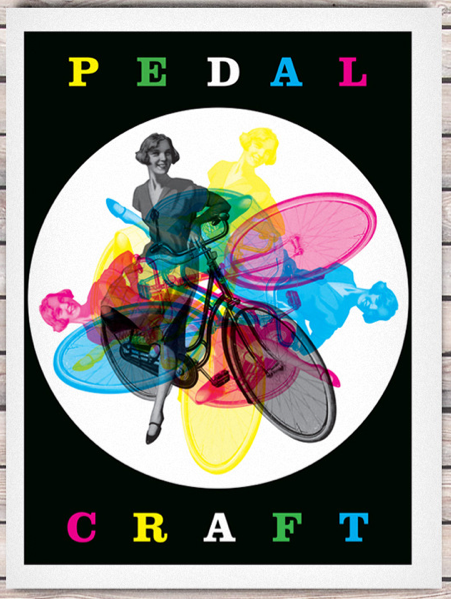 ++Found them via my AIGA feeds and they are all property/from PedalCraft -- where you can see the rest. Thanks to Kenneth Schwartzman for the tip directing us here. "Superintendent Gerald Hopkins told the meeting that the district would have supported the bike ride if students had alerted officials ahead of time." 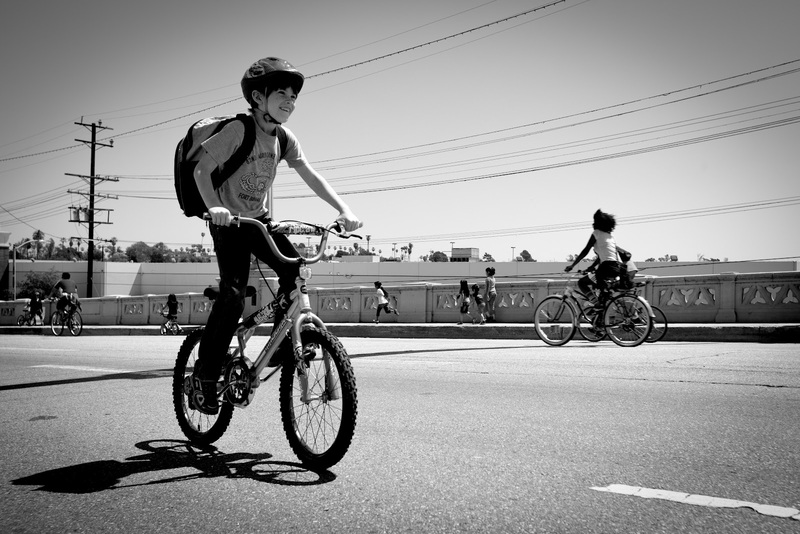 Who calls a school superintendent to ask if it is OK to ride a bicycle to school? What kind of power do they think they have? A lot of those kids are 18 and are no longer required to ask anyone's permission to do anything. Cameron in danger? He is a high school Senior. Anyway, just when that whole idiocy starts to work its self out we get this next beautiful example of education and reasoned response to the needs of children and families in Gilbert, Arizona. "All have put children at considerable risk, and our board has acted to keep children safe before there is a predictable event," Duncan said in an e-mail. 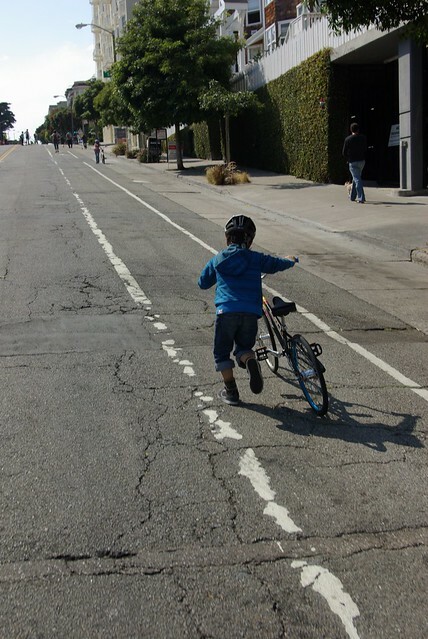 "The streets are marked with bike paths but are not wide enough for children or parents to safely use them." So all of the parents have had to sign an agreement that they will drive their kids to school- mistake number one. I am a parent in a school that tried to prevent me from letting my daughter walk 3 blocks home by herself after school. After pointing out that they had no problem with her walking to school alone everyday and then providing them the name of my attorney should they feel the need to push this further, Úna was never again prevented from walking home on her own. Parents can and must fight this kind of idiocracy. Mistake number two? 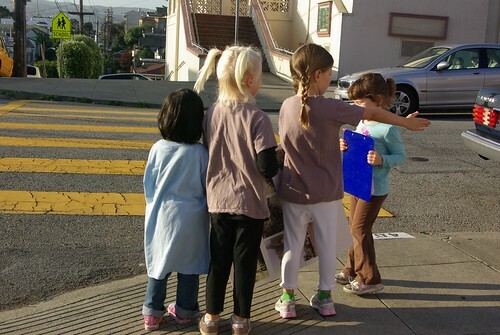 If the Charter Board of Edu-Prize School wishes to throw their power around, do something to make your streets safer!!! That is what we are doing here at many schools in San Francisco. 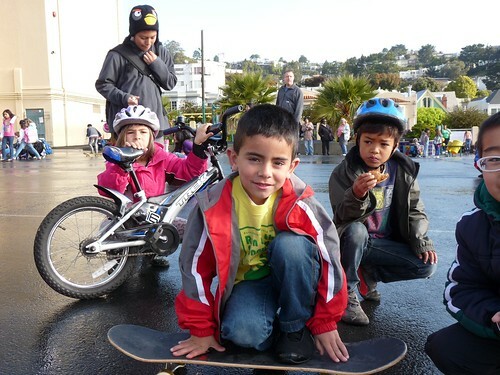 We are returning the streets around 181 of our schools to the 15 MPH spaces they are supposed to be, we are expanding our bicycle lane network and working for even more (and with this and other changes our elementary school had 31% of our student body participate in Bike To School Day even though it was raining), we are using our Safe Routes To Schools money to make needed changes, and most importantly, we are not letting the world just keep on trudging along running over our children. Obviously these kids will be killed any moment. Yeah. Schools are supposed to be places that teach kids how to think. Schools are not there to police a parent's transportation decisions. Forget the "my kids get great exercise" argument. How about the "I am out of work and the car isn't working so we will be using those bicycles we all got for Christmas" argument? Or the "We live three blocks from school so we are walking" argument? Or my personal favorite "My kid is still having trouble reading because you are too worried about her using her scooter" argument. If this we Gilbert we would be rebel outlaws! Kids have to take classes in critical thinking to graduate and go to college. I think some "educators" could do with some brushing up in that area, don't you? Yesterday, while watching our oldest son graduate from high school, some heartless creep with no morals and a hole in his soul STOLE DECLAN'S BICYCLE!!!!!!! 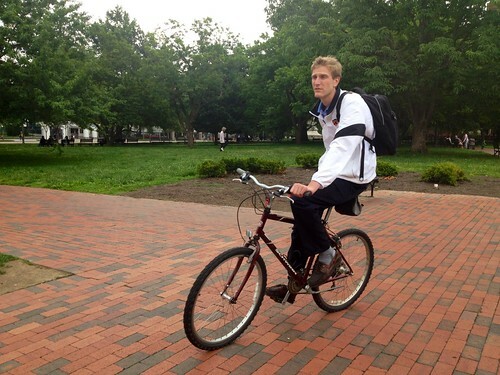 As anyone who has read this blog knows, Declan loves his bicycle. He rides it everywhere. People all over San Francisco see him ride with us everyday, they recognize him and some of them wave to him as he goes along. 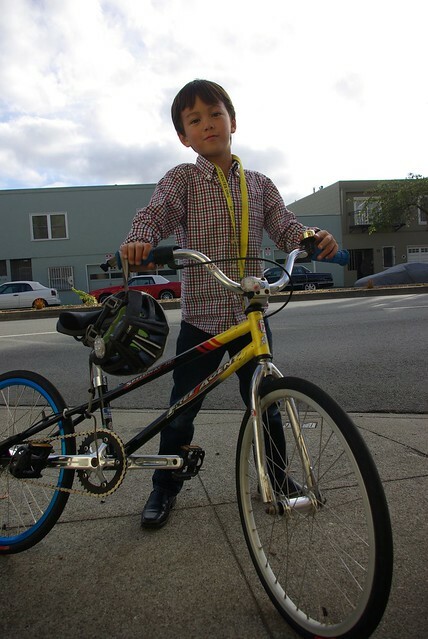 Declan is somewhat unusual as he is probably the youngest regular bicycle commuter in San Francisco. While the rest of us get yelled at by drivers, Declan gets all kinds of waves and shout outs by those driving by. 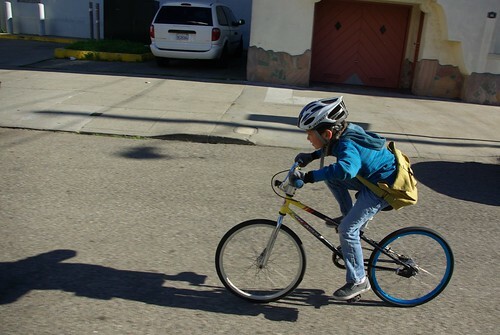 I know for a fact that other parents who have seen him ride all the time have started to let their own young kids start riding with them through SF. 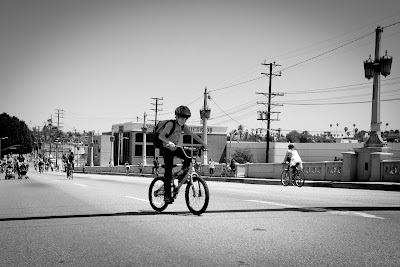 Without meaning to, Declan has become a catalyst in our community by doing nothing more than riding to the Farmer's Market or pedaling to school. It is a Free Agent steel BMX, black paint with yellow and red decals. The rear wheel is a custom built, skinny 20", anodized blue and laced up with a new S-A 3-speed hub with integrated coaster brake (if you see the wheel it is ours, there isn't another one like it). It does not match the front wheel which is silver. There are no hand brakes. It has a 3-speed twist shift with blue hand grips. The cranks are quite rare because of their size- 145mm. It has a new black Tony Hawk seat with molded finger grips under the seat nose and under the back of the seat (makes it easy to pick up and move). 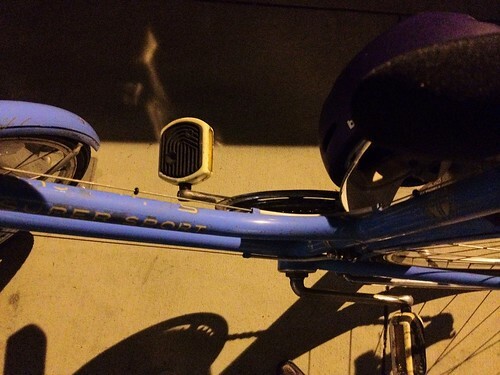 There is a brass Incredibell on the handlebars and the lights were mounted on it at the time (Planet Bike blinky on front handle bars and Knog light on seat post. 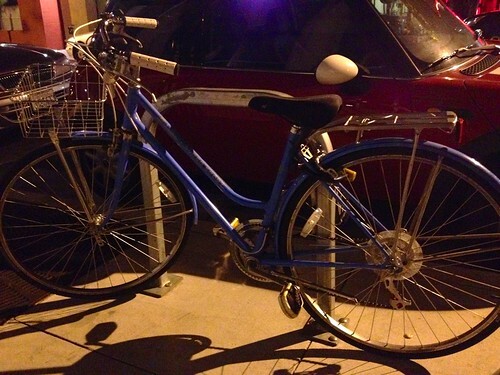 This bicycle was stolen from Otsega Ave near Onondaga between 2:30 and 4:00 pm on May 24th, 2012. 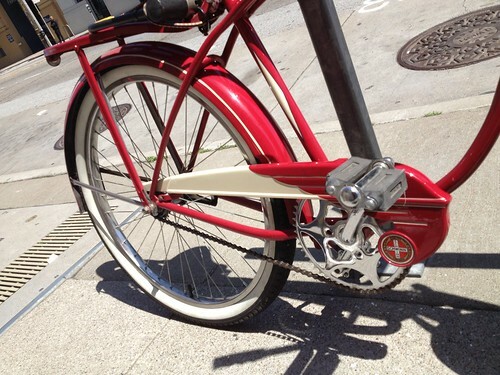 If you see Declan's bicycle, or parts of it call your local police and reference the San Francisco police complaint #T12008286. It is out there, probably heading for a Bay Area flea market or Craig's List! 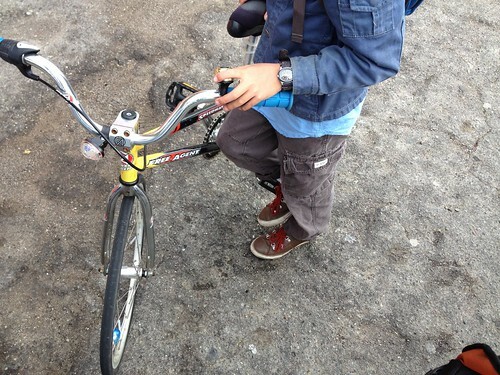 It took us months to find all the parts to make a bicycle that would grow with him, was light enough for him to pick up and get around easily on, and had the right gearing for him to be able to utilize successfully. James had to build the real wheel himself as well as make modifications to the frame to allow us to use an internal hub. Without his bicycle, all of our summer riding plans are scuttled until we can put a whole new bicycle together. Declan no longer rides on the back of our bicycles much. 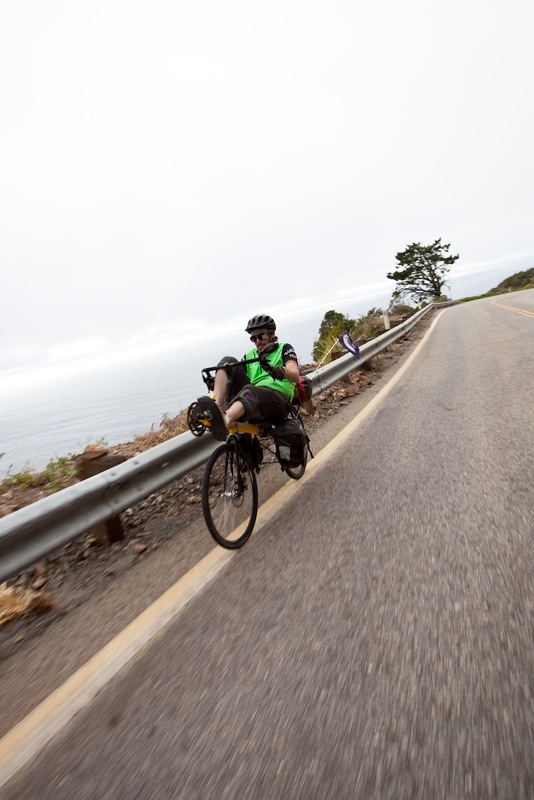 He can ride 20 miles in a day through San Francisco. He is a strong, sweet, independent child who thinks riding in a pack with his family and friends is the best thing ever. He is too young to have to learn that there are a lot of people out there who couldn't possibly care less. Addendum- This was how happy he was to get his training wheels off his old bicycle. as you know, i was in DC earlier this week with the amazing and inspiring group of #topblogueras for the first ever latina blogger conference. i hear next year will be in my home state of texas, but i digress. as far as i know, CYLRAB was the only blog i noticed that focuses solely on an active lifestyle. if i am mistaken, blogueras please correct me. and i noticed a lot of smiles and eyes lighting up when i told the blogueras i met which blog i write for. that was cool to observe! 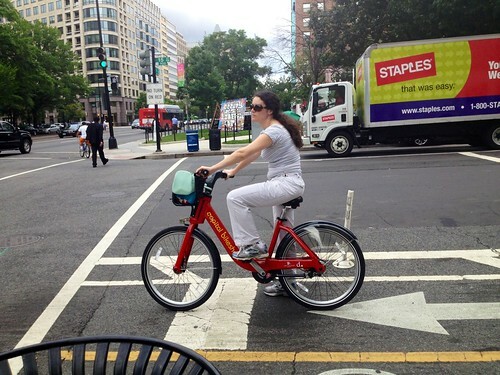 the woman below is a DC resident and told me she loves & uses the DC bikeshare! although what i am going to say may seem out of the scope of this blog, i promise it isn't. i'll get to the biking in my lil diatribe, i promise. 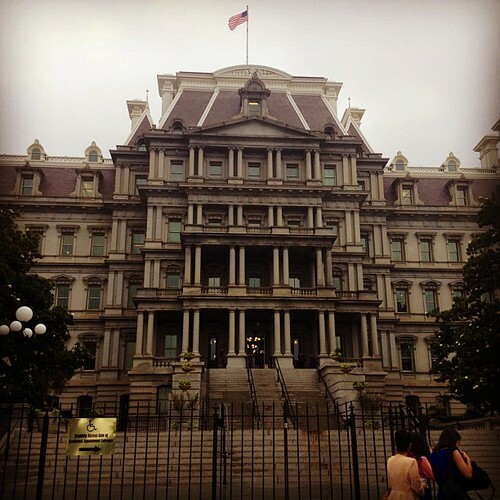 so back to the white house. 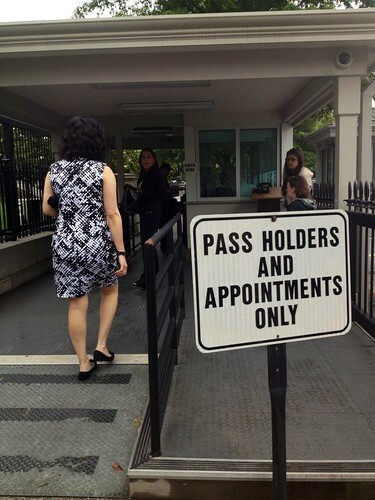 there was a panel of obama administration latinas who were championing for their chief. over here in the bubblelandia of san pancho, we are not necessarily obama cheerleaders, so i was definitely interested to hear his adminstration's latina representatives talk about immigration. immigration is a big topic here in califas, so my ears were definitely ready to listen. 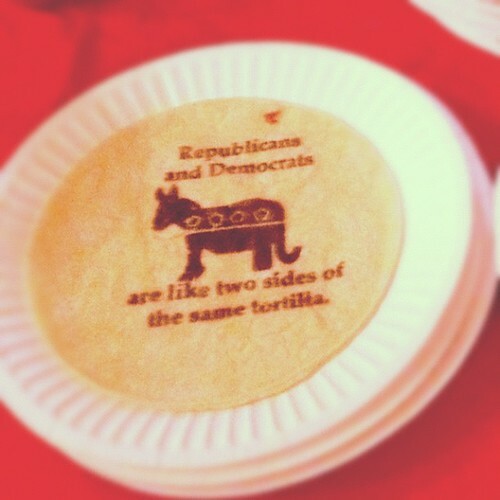 HOWEVER, we are not obama haters either. we just expect more of him and hope that he truly has the best interests of US latinos (documented or not) at heart. 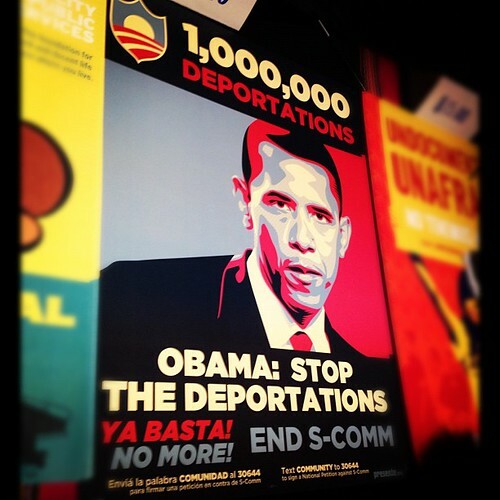 but with over 1 million deportations under his administration's belt, he has some 'splainin' to do. the briefing started with Cecilia Muñoz, the Director of Domestic Policy, who had some unanswered questions after a particularly fierce bloguera, Maegan La Mala asked some questions relating to secured communities and its affect on survivors of domestic violence. Muñoz notably left right after answering that question. 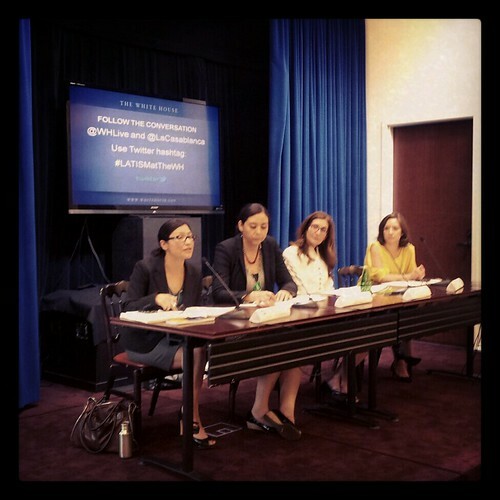 the panel of latinas consisted of Julie Chavez Rodriguez, Associate Director, Office of Public Engagement; Alejandra Ceja, Chief of Staff, Office of the Under Secretary; Department of Education, Lisa Pino, Deputy Administrator for the Supplemental Nutrition Assistance Program of the Department of Agriculture; and Marissa Duswalt, Associate Director for Policy and Events, Let’s Move! Initiative. CALLING ALL LATINOS: LET'S MOVE! as far as i know, CYLRAB was chosen to go because of the health topics on the panel, particularly the Let's Move! Initiative. i personally think that health care has become a social justice issue. i'm not insured, and i know i'm not alone as it is ever increasing. 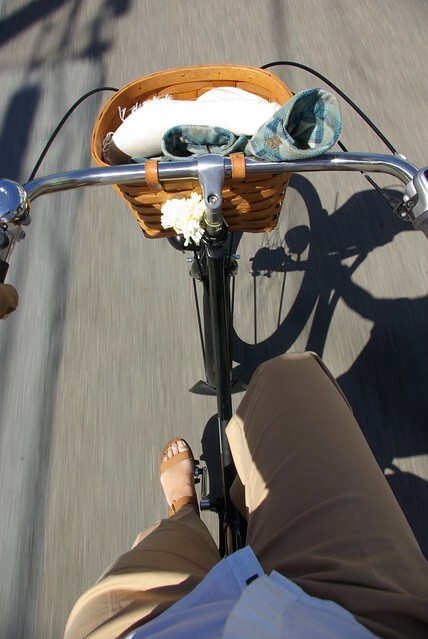 i use biking to keep myself healthy as i can for preventative measures. i know that latinos (documented or not since your body doesn't check for papers) in particular are at high risk for diabetes and high blood pressure. and i have borderline high blood pressure, despite all the biking i do, so i've had to start to eat better as well. i do love that salt...but i've cut back on it considerably. also, i didn't know you could use what was once called food stamps, EBT, etc., to buy seeds so you can grow your own garden. that's really cool. a lot of work, but really cool. especially in "food deserts" like the place i used to live in brooklyn 10 years ago. horrible food choices in my neighborhood was my first introduction to access to food as a social justice issue. i know that it helps to have role (or ROLL) models for healthy active lifestyles, and you just don't see a lot of brown faces out there doing that sort of thing. i am fortunate to have my mom as a role model for healthy living. she has run nearly every day for the past 25 years. believe me, that sort of dedication and discipline doesn't go unnoticed, even if your kid is brooding indoors, listening to music and reading. i haven't found many latino blogs that are like the great ones in the african-american community like, black girls run!, and outdoor afro. i do hope that meligrosa's and my presence show other latinos that we can still be ourselves and active too. and not only just active, but really enjoy and LOVE the active lifestyle. i also hope that adrienne's posts about biking with her family show what an enjoyable and wholesome activity it is for all 5 of them. access to outdoors is something that is hard to come by is something i grew up thinking. but actually it really isn't if you just take a walk around your neighborhood. i saw a video recently called 23 and 1/2 hours, that was trying to reframe how people think of exercise. the narrator posits, "can you limit your sitting and sleeping to just 23 and 1/2 hours a day?" pretty powerful question, don't you think? 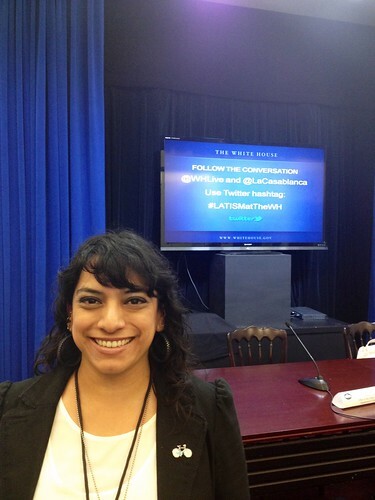 i'd like to thank everyone that made it possible for me and all the #topblogueras to go to the white house. it was an amazing experience, and i am forever grateful. one of the most powerful experiences of my life thus far. there are more, but these are a few of the scenes i saw while walking around in the mist of DC. before anyone starts a helmet/no helmet war, please refrain from doing so since plenty has been said on the topic. these are just observations. Was it as good as Kevin's? friday fun times: where are you going this weekend? i'm currently in vegas en route to DC. on a total and complete whim i decided to apply for the first ever latina blogger conference. and....i got an email earlier this week saying i was accepted to go. we are going to go to the white house and hopefully (not set in stone at all...) MEET MICHELLE OBAMA! please go on over to LATISM (latinos in social media) to check out what they are doing and thank them for this amazing opportunity! 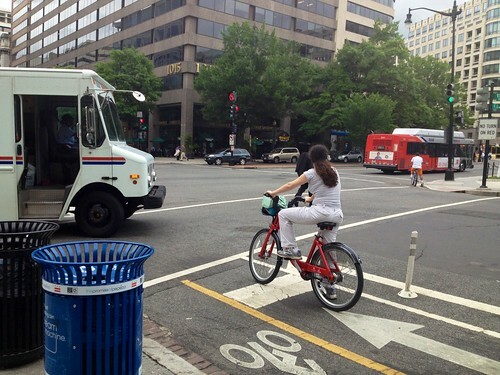 and i cannot WAIT to try out DC bike share while i'm there! off to do some research (but only a little bit since i'm in VEGAS). mwa. have a great one! ok, maybe an hour later it's done...? looks like two intersections got the same treatment that another wiggle intersection got during the wee morning hours of bike to work week last thursday. It has been a while since I had to bicycle to "work". But I take my bicycle just about everywhere else. I call it "Bike To Life" and anyone can do it. Give it a try! 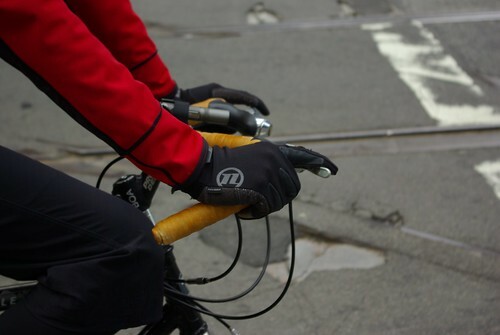 end of bike to work week, what next? 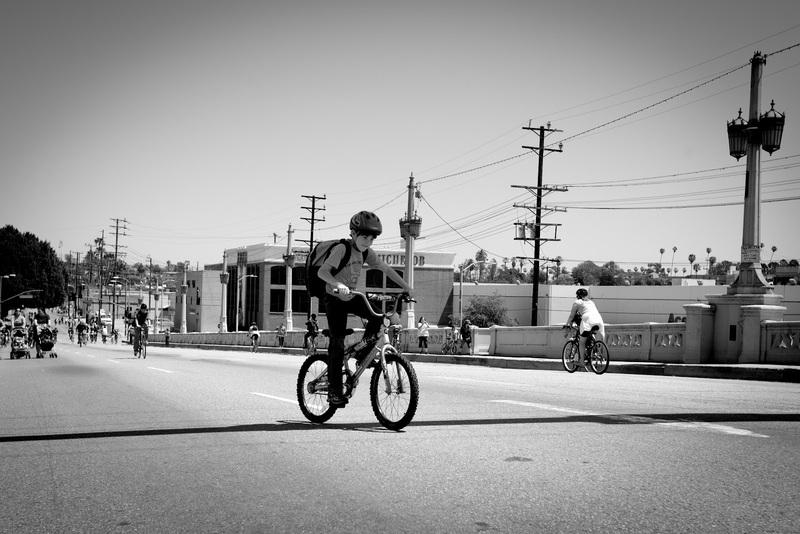 well, every day for me is bike to work day, but it isn't for everyone else. how can we change that? 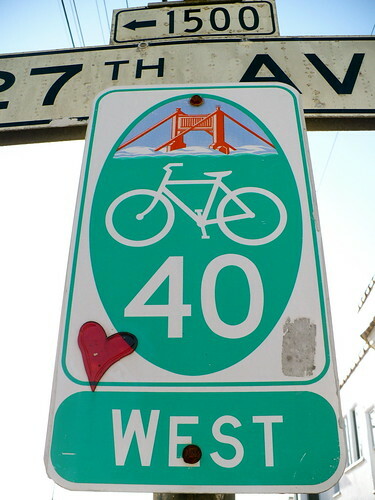 many people say that to help them bike more is to have more protected bike lanes. 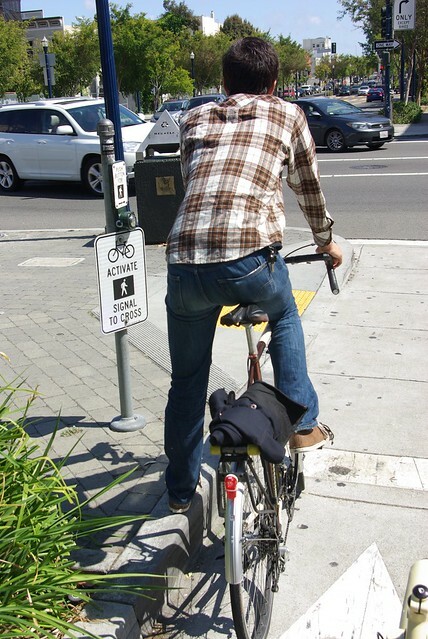 maybe even "just" bike lanes would be a start. 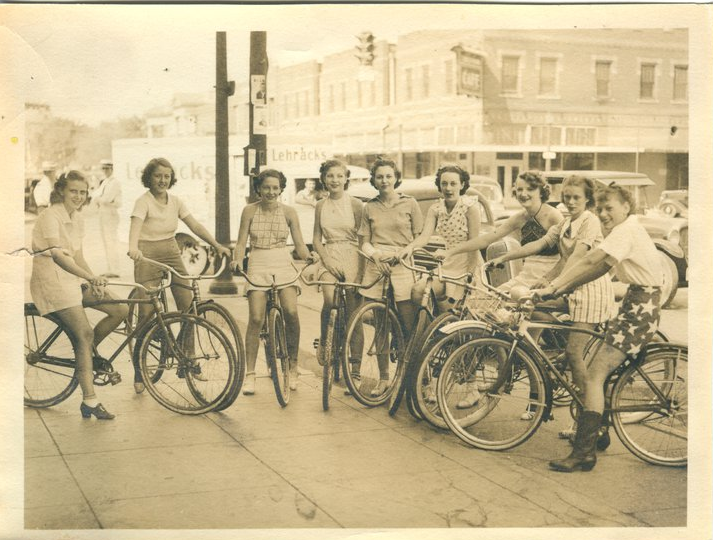 maybe the connection between biking everyday leads to touring, or extended bike rides. i know that is the path i've been following personally, and i read similar experiences across the bikely blogosphere as well. last week on our FB page we announced we are working with the Adventure Cycling Association to promote their awesome initiative of creating a U.S. Bicycle Route System (USBRS). what is a USBRS? U.S. 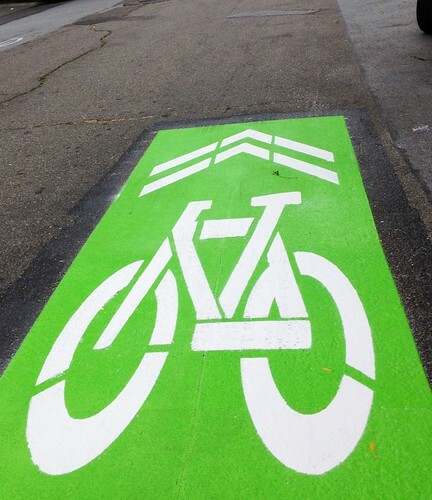 Bicycle Routes is a proposed national network of bicycle routes, and they are intended to link urban, suburban, and rural areas using a variety of appropriate facilities. 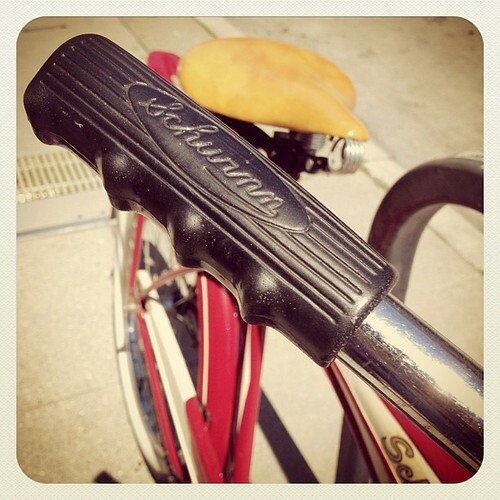 if you donate $25 or more before Saturday, May 12 at 11:59 EST, and you will be entered to win a Brooks B-17 Saddle. 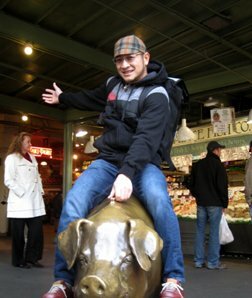 this is my personal saddle of choice. it's awesome, and fits like a glove. which will be great to comfort you with all that riding you will be doing on the USBRS. if you donate at least $100, you will receive a Walz cycling cap designed specifically for the campaign, while supplies last. 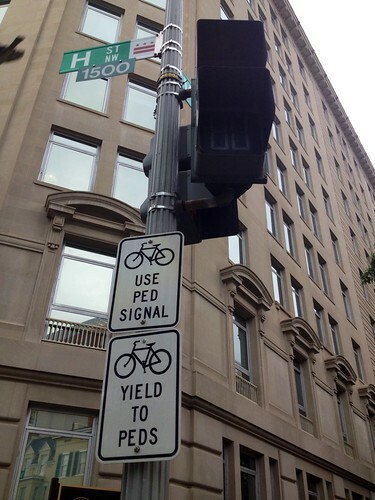 Better yet, you’ll also be directly impacting the future of bicycling in America. 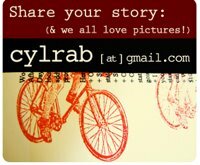 we have never done a partnership like this before, but all four of us here at CYLRAB, feel that the creation of this bicycle route fits the mission of this blog...which is to change your life by riding a bike. 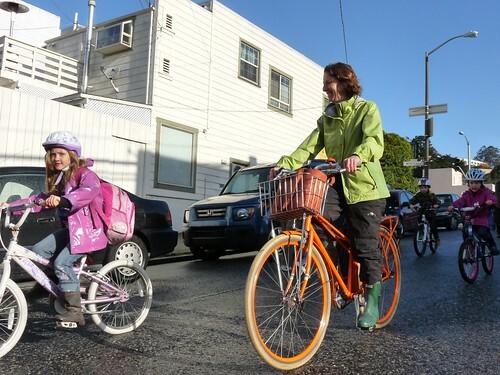 if more bike routes means more people on bikes, then we feel it's a win win for everyone. have a fantastic weekend! 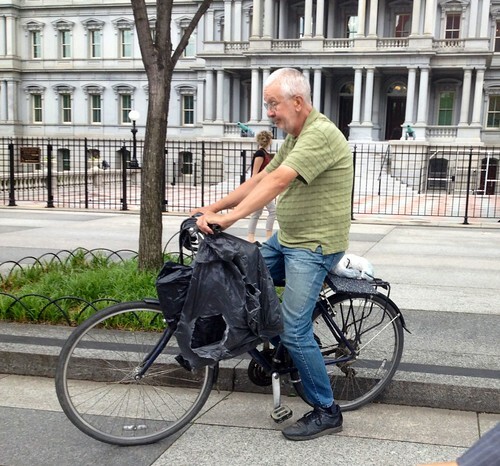 i hear there are more bike to work weeks throughout the country next week. can't wait to see bloggy reports from them! Adventure Cycling is offering many more prizes and fundraising challenges throughout the campaign. To keep track of these offers and to support the project: like the U.S. 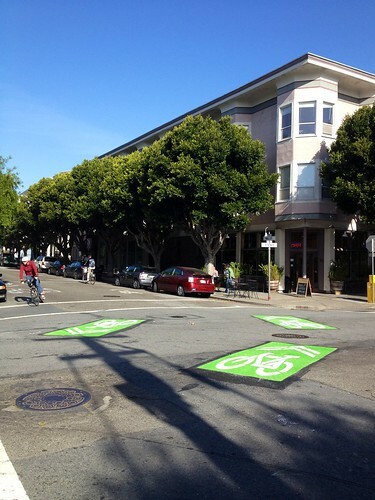 Bicycle Route System on Facebook or follow it on Twitter, or learn about other ways to get involved. 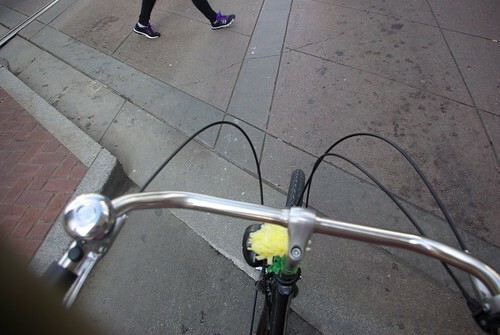 for me, everyday is bike to work day. 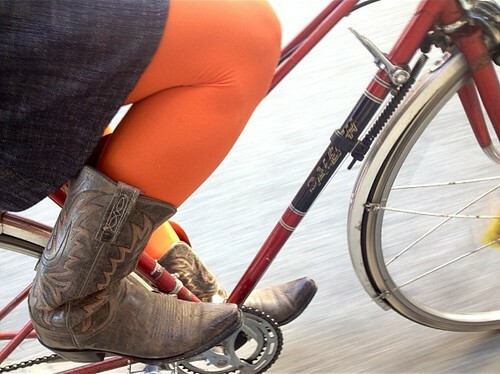 so during bike to work WEEK, i try to dress up a little bit more to be a good ROLL model. these past couple of days have been pretty warm (for SF standards), so time to bring out the dresses! there are thousands of new bikers expected to hit the streets. here in SF, local officials have a VIP ride and the mayor, along with other city officials and policy makers, rides to city hall on a (his?) bike. 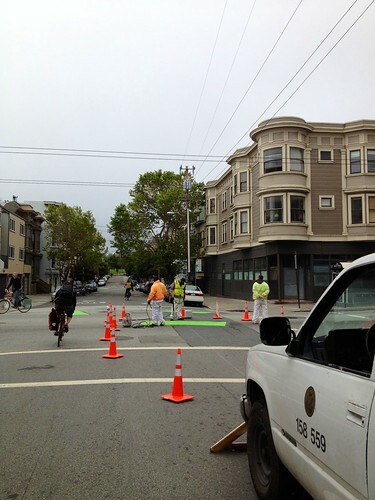 this shows how much work the SFBC has done in order to have some political clout at city hall. and on that note, i'm off to find an energizer station and some swag! support a burgeoning local business! mamak: a common roadside food stall found in Malaysia. doesn't he look like a great person? that is because he is. in addition to being great fun, he also wants to be is a bike powered business owner. that's right. 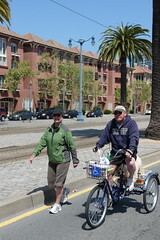 not only is ian a great person with fantastic positive energy, he wants to change his life by owning and operating mamakSF, a pedal-powered food cart. Born and raised in Malaysia. Migrated to Southern California as a teen. Now a happy transplant in San Francisco. Growing up in Malaysia and eating at mamak stalls was the highlight of my eating life. 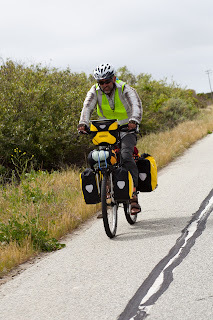 Love of food and cycling fuels my desire to feed Malaysian inspired food from my pedal-powered food cart to everyone. here's a video explaining his idea. how can you help? ian has a kickstarter campaign to raise funds to help build his pedal powered business. it's great to see a minority business owner get started! 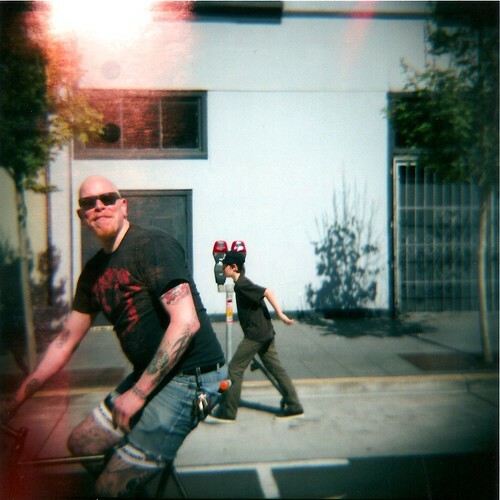 ian has done a lot of good things for the biking community here in SF. now it's our turn to contribute to this great cause. oh, and the toadies are GREAT. and my mouth is watering thinking of the (veggie) rojak! mmmm. 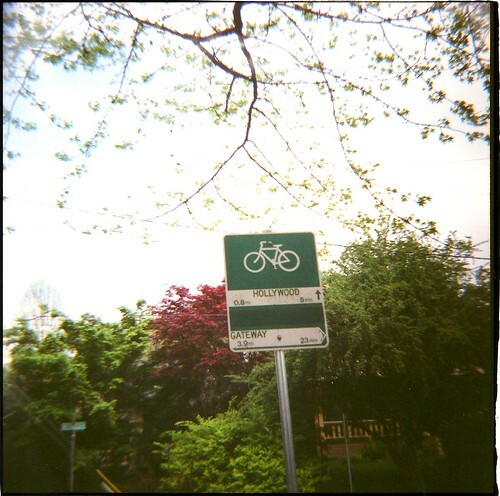 One of the things I like most about bicycling in Portland are all of the wonderful signs they give you. They tell you where to go and about how long it will take to do so. I have always found the timing estimates to be spot on. It is quite hard to get lost even though just about everything is a clapboard house with a big tree in front of it. The ones in San Francisco are a little more interpretive. We have room for improvement. They usually come in threes, right? the other day was walking back from lunch and ran into this beauty. the owner was just leaving the post office, so i got to talk to him a little bit about his bike. they compliment each other very well, don't they? 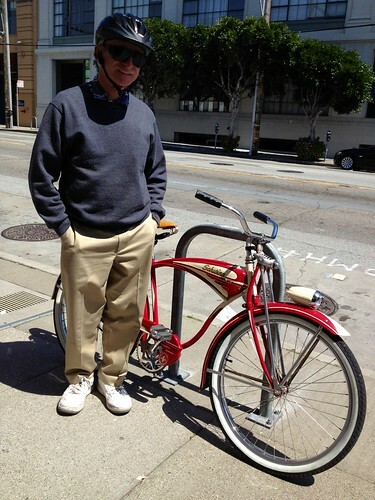 he told me it is a 1951 schwinn that he spent years restoring. 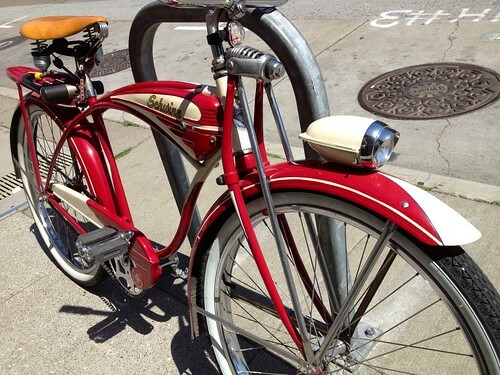 looks like a lot of love and labor went into that bike, because she's a beauty! she has 95% original parts. including this 1930s-1950s era spring suspension. look at the detail on those handlebar grips!! 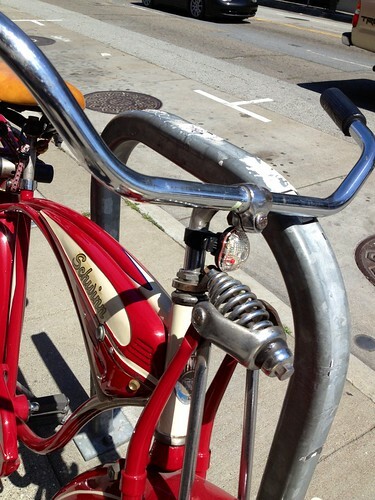 a generation later, in the 1970s, this 1972 schwinn was born. not sure if original pedals, but they really do look cute and probably are same era. she's new to my east bay homegirl. now it's time for us to go on some rides! 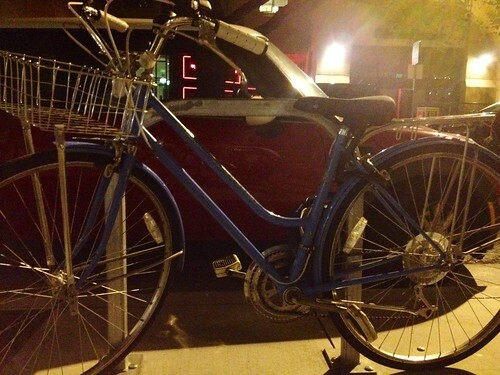 congrats on finding the cute bike! basket and back rack: cargo bike.